Nowadays, you can’t go a single day without reading a financial opinion about how a major dislocation is imminent or that the economy is on the mend and this generational bull is still intact. The fact that the US stock markets have been so choppy to start the year has confused not only some columnists and bloggers(myself included), but some professional money managers as well. As I stated a couple of posts ago, there are plenty of short-term signals showing that now may be time to show caution. On the other hand, long-term price action does continue to show strength and the bull fundamentals do not appear impaired as the path of least resistance for the markets continues to be upward. 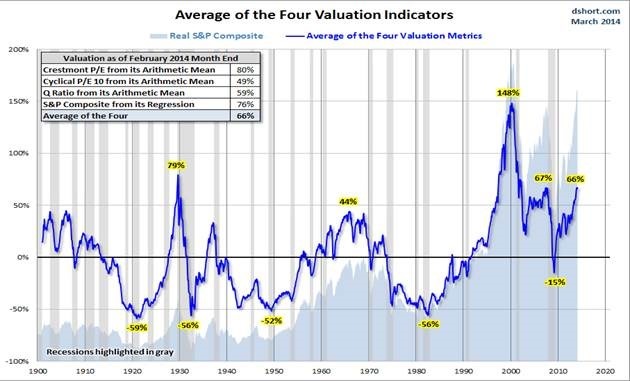 So based on this chart, we’re rapidly approaching 1929 levels of overvaluation of 79%, already passed the late 60’s peak of 44%, and are right back to 2007 levels at 66%. Do I think a soul crushing dislocation is imminent? Not at all. The chart also shows that things can get a lot more frothy ala 2000 and its 148% overvaluation level for all things dot.com and tech. Jeremy Grantham, via a recent Barron’s article, agrees that the market is 65% overvalued currently but that it would need to rise another 30% before he would consider it true bubble territory. For the arithmetically challenged, that puts the S&P 500 over 2,300. So according to J-Grizzle, there’s a lot of dancing left to do while the beat keeps bumping. The S&P 500 hasn’t seen a correction of any real significance in about 2 years. When you throw in the fact that this bull recently turned 5 years old, nervous traders start to think that we just gotta see something to the downside soon. Maybe. Maybe not. Maybe f@$# yourself. My theory on the market is that it’s like a little kid. Feed it a bunch of sugar and watch it run like crazy. Thank you, Marky Mark. Despite the tapering, the Fed is still plugging a ton of sugar monthly into treasuries and MBS to keep these markets liquefied and rising. Add to that biotech, a sector leader and market darling, is starting to show some real weakness. I think biotech is an easy short here using BIS or buying some Puts on a market leader such Amgen or Gilead. On a different note, there are some commodities now showing weakness as well. Coffee has been ripping in 2014, but this week has seen that momentum stopped in its tracks. It may just be a breather before it continues higher or it may see further downside action to eat up a nice chunk of those “easy”, early returns. The coffee ETF, JO, is an adequate proxy for those looking to trade the action without dabbling in futures. Either way and despite the current price action, my favorite indicators say that it’s not quite time to go short coffee yet. If they do give a signal, then it’s possible to see gap-filling action(on a weekly chart) all the way down to $28 or possibly $25 depending on the momentum. Whether you lean optimistic or pessimistic is irrelevant. If you’re trading, then mind your stops. Managing your risks is all important.